Land reclamation of the Financial City, previously known as the Port City, has been completed, the Ministry of Megapolis and Western Province Development said. While land reclamation has been completed, construction of the city is scheduled to begin soon. 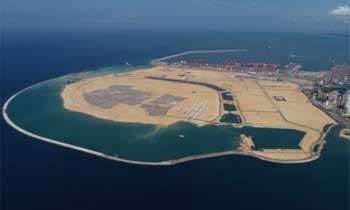 The Port City once completed, will be an extension of the Central Business District of Sri Lanka spanning 269 hectares of reclaimed land from the sea. The land will be developed as a residential, retail and business destination. The development will comprise of five different precincts including the Financial District, Central Park Living, Island Living, The Marina and the International Island. Functioning under its own special jurisdiction, the city will have its own economic and commercial laws that are to facilitate the operation of global multinational corporations. Once completed, the project will have reclaimed 269 hectares with 116 hectares being handed over to China Communications Construction Company (CCCC), the parent company of China Harbour Engineering Company (CHEC). The remaining land, owned by the Sri Lankan Government, will be divided with 62 hectares to be used to set up a financial city and 91 hectares to be used as public spaces. So do we get to know what the 116 ha to be handed over to CCCC is to be utilised for? In the given photo where is the 116 hectares of CCCC lying and SL held 62 ha or 155 Acres. Also how will SL held land is utilized as a matter for public to knowledge. It is great to see MR's initiative and great project has concluded the biggest milestone. Thank you MR. Entire project will be completed by now, if there's no interruption.